Posted on October 27, 2017 by Matthew Leib. This entry was posted in Spotlight, Staff Stories and tagged engaging interests, ovations, Spotlight, staff story. Bookmark the permalink. 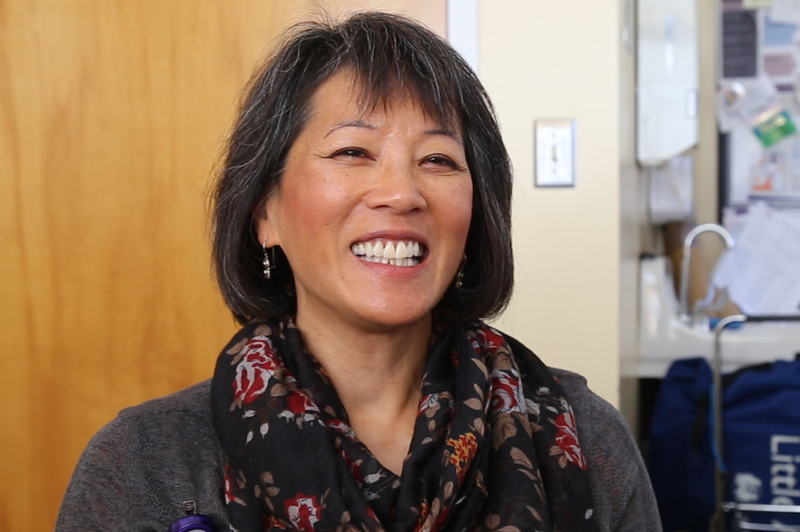 Take a walk through Harborview Medical Center at lunchtime and you’re likely to hear Pamella Guntrum before you see her. As manager of Program Operations in Clinical Development & Patient Education, Guntrum keeps a busy schedule. But at least once a month, she sets work aside and devotes her lunch hour to practicing a different sort of medicine — music. Her stated hope is that the music offers passersby the freedom of a moment—a chance to check in with themselves amidst an otherwise bustling hospital environment. Born and raised in San Francisco, Guntrum attended City College of San Francisco, San Francisco State, and Russell Sage in New York on her way to a career in nursing. After spending 25 years working in healthcare in upstate New York, she joined UW Medicine in 2003, initially as the educator for ambulatory care and the manager for the Clinic Float Pool at Harborview Medical Center. Guntrum received her Doctor of Nursing Practice from the University of Washington in 2013, completing a capstone project, “Recommendations to Reduce Barriers to Electronic Documentation of In-Patient Diabetes Education,” illustrated the challenges of using electronic documentation. Her mentor for the project was Dawn Corl, a fellow musician who serves as Diabetes Clinical Nurse Specialist at Harborview Medical Center. Corl and Guntrum will take the stage at Meany Hall for Ovations, this Sunday, October 29. In an encore performance after their debut as a duo at Ovations 2015, they will play “La Belle Murcienne,” one of five pieces composed by Joaquin Turina titled “Mujeres Espanolas” (Spanish Women), followed by what Guntrum describes as “a saucy tango” by Argentine composer Astor Pizzolla. Don’t miss them and 13 other talented performing acts—register for free tickets before it’s too late!